1. EN131 part 1 to part 4 approved 150kgs, AS/NZS approved from SGS. 2. The economical type 1A alternative. 1. Model: FPS-04, FPS-05, FPS-06, FPS-07, FPS-08, FPS-09. 2. Steps: 4, 5, 6, 7, 8, 9. 3. Open height: 1560mm, 1795mm, 2025mm, 2255mm, 2490mm, 2723mm. 4. 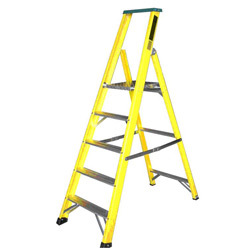 Highest standing height: 1650mm, 1902mm, 2150mm, 2400mm, 2650mm, 2900mm. 5. Base width: 522mm, 555mm, 585mm, 620mm, 650mm, 688mm. 6. Base depth: 997mm, 1170mm, 1340mm, 1510mm, 1690mm, 1860mm. 7. Weight(kgs): 8.68, 10.1, 11.22, 12.74, 13.96, 15.6.